Waiting for my breakfast porridge, I was deep in heavy hearted conversation with a friend back home this morning. When suddenly a flash of irridescent teal swooped into the pool, dipped its long beak and without stopping flew up to the balcony across from me. I was so thrilled! 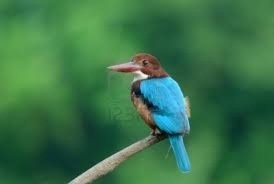 It was the elusive kingfisher, a bird attributed with good luck. It repeated this performance 3 more times in rapid succession each time landing in a different spot closer to me affording me the opportunity of closer inspection. The kingfisher’s plumage is colorblocked with red, white, black sections as well as the bright teal green. As I came back inside I noticed my heart was filled with birdsong. I made a note to have a Kingfisher beer with my lunch later in celebration. This entry was posted in Uncategorized and tagged Going to Goa Blog, Katy Allgeyer, kingfisher beer, kingfisher birds, Scott Morgan, traveling with cancer. Bookmark the permalink. one of my favorite birds !!! Did u see them often in India, Dan? You are lucky indeed to have seen one!